Join us at this stylish venue and enjoy an evening of mingling and getting to know new people from all over the world. Let’s get together for a chance to connect and give our newcomers in town a warm welcome to Hamburg! 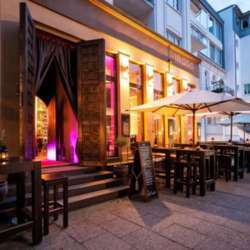 Imara is also a well-known restaurant with delicious oriental tapas. We are firm believers in 'the more the merrier', so feel free to bring your friends along with you. However, where possible, please get them to sign up for InterNations first for discounted entry. There will be a customary welcome drink but based on a game again, maybe the same? maybe a different one? Who knows?! ..... STAY TUNED! Transportation: U3, Hoheluftchaussee or take Bus 5 to Eppendorfer Weg / Bus 20/25 to Gärtnerstraße.